Adam finds the remake of William Castle’s House on Haunted Hill even more effective than when initially released. The Film is being released by Scream Factory on Blu-Ray. Remakes are tricky things. For every John Carpenter’s The Thing, there’s countless Total Recalls, Karate Kids, Halloweens (2007), The Hauntings, The Jackals. Remakes require a certain amount of finesse and understanding of the material you’re adapting. What worked, what didn’t, what needs to be updated, what needs to be left alone, why are you remaking the film, all questions that are added when remaking a film. Nineteen years on William Malone’s sly remake of House on Haunted Hill works because it understands these requirements and does so with stylish aplomb. The film keeping most of the plot but updating what’s needed finds itself with the best possible situation, a successful remake with a juicy overripe Geoffrey Rush performance to rival original star Vincent Price’s one. Amusement Park Designer/PT Barnum style Icon Stephen Price (Rush) in a strange flirtatious game with his Femme Fatale Wife Evelyn Price (Famke Jansen) throw a birthday party. Not any kind of birthday party but one that you would expect from an Amusement Park Magnate’s bored possibly murderous wife. One that takes place in an abandoned insane asylum from the 1930’s now a luxurious home in disarray. Price has cooked up a night of Extreme Haunts for the guest and his wife’s amusements. What no one counted on is the House itself has other plans. With a group of four strangers lead by Sarah (Ali Larter) and Eddie (Taye Diggs), the Prices are trying to survive the night locked in this murder house. 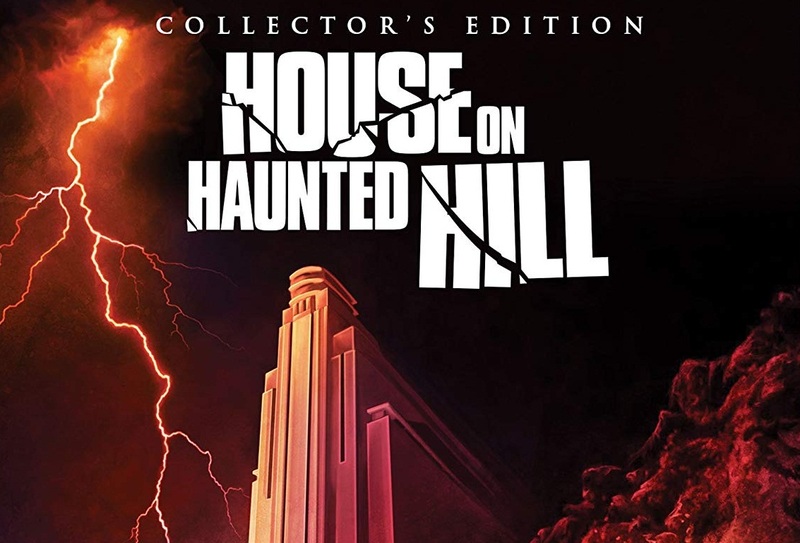 Two decades on House on Haunted Hill works even better now with the advent and rise of Extreme Haunted Houses, Escape Rooms, and Universal Halloween Horror nights all en vogue. The film mixes scares, tension, gore, and comedic beats to great success and with the sort of flair that recalls the very best of Tales from the Crypt. It is no mistaking that the original producers for Tales are the very same on this film (Joel Silver, Robert Zemeckis, and Gil Adler). Malone keeps everything moving quickly and visually glossy. Yes, the film does suffer from that late 90’s over-stylized visual acumen that screams David Fincher, even down to the Seven-style credit sequence. Considering bigger budget glossy studio produced Horror is becoming a rarer occurrence, this is affectation is a welcome alternative. The work that Academy Award Winning actor Geoffery Rush does here is no different than any of his more “Awards Friendly” projects. That is to say that Rush gives his performance the same sort of detailed passion that has won him such acclaim. As Price, Rush seems to relish every moment he’s given and chews scenery like it was a 12-course meal, pardon the clichés in a review, but here it applies doubly so. Playing both a character and a play on Vince Price seems to have inspired Rush who up until this point had not gotten the role in the Pirates series. Here you can see the groundwork laid for what would come later. The sort of maniacal glee twinges in every second of the performance, as though a small child had found the secret cookie jar with no care of consequence of eating each and every cookie. Believe you me, Rush eats every single damn cookie in that jar. House on Haunted Hill was designed to be the slickest, goriest, horror ride to be taken. For the most part, bearing a few creaky moments, it excels at just that. The old adage is definitely true here; they (being studios) don’t make ‘em like this (being House on Haunted Hill) anymore. The new 2K Scan from The Original Film Elements provided by Warner Brothers to Scream Factory is both great news and possibly unwelcome news for many. Great news first; the new transfer is gorgeous. Everything that has aged the original DVD transfer is gone. What we get is a beautifully sharp and perfectly contrasted image. The black levels are near perfect allowing for an image with a lot more definition in the shadows. For a film that has vital information in the blacks, this is a key allowing for a newer viewing experience. The possibly unwelcome news is that the color grading has gone away with the Brownish Hue that colored the original DVD release. This film’s original look was more akin to the Bleach By Pass process that Fincher’s Seven went through. Like that film, the newer transfer has removed any signs of that color grading. What you get is a beautiful image that represents what they shot on-set and a less dated look. Most will find this trade off a welcome edition though some will want to nitpick this. The Commentary by William Malone is a port over from the original disc. Lots of good tidbits how he referenced Brothers Quay, along with some cast and crew anecdotes like the actress who plays Gozer shows up as a nurse in one of the nightmare sequences. A decent, albeit dry commentary. The three new features collectively feel like part of a whole as they’re all titled The Making of House on Haunted Hill. Collectively they amount to a 64-minute making of. Though you cannot “play all”. The Making of House on Haunted Hill: An Interview with William Malone is a 37 min part interview, part making of. Malone discusses how he got the job, the preproduction where he drew a lot of his own storyboards, and production of the film with anecdotes about how amusement park Magic Mountain wouldn’t let them shoot in the park even though at the time it was owned by WB. How they wanted to shoot at the now-famous Ennis house, like the original, but couldn’t because of all the houses and modern roads that were built around it. The interview is very technical minded with a discussion with Film stock, lenses, color grading. And a surprisingly reveal about the final Ghost which I won’t ruin. The Making of House on Haunted Hill An Interview with Don Davis is a 9-minute interview piece where the composer discusses not just his work on House on Haunted Hill but his theory on scoring and the challenges of doing a score where a song is heavily leaned on in place of score (in this instance the Marilyn Manson cover of Sweet Dreams). The Making of House on Haunted Hill An Interview with EFX supervisor Robert Skotak is the final featurette of the trio. Running at an all-to-brisk 18-minutes Skotak discusses the miniature work and the reel for real work done along with other pieces that make up the Visual Effects work. The featurette has some great behind-the-scenes photos of the work of that was done. Skotak discusses in detail the old school force perspective work done. How they did the final Ghost VFX in even greater detail than Malone’s interview. Anyone that’s at all curious how ingeniously produced these Effects were should check this out. A Tale of Two Houses is an older 19-minute featurette ported over from the DVD edition of the movie. The feature is basically a side by side comparison of the two films and the houses. Behind the Visual FX is an all too brief (7-minutes) breakdown of all the effects work of each of the set pieces. The Deleted Scenes are each introduced by Malone. The biggest reveal is that Debbie Mazar was cut entirely from the film. She plays Ali Larter boss in what seems like a homage to True Romance’s Lee Donowitz. There are a few additional scenes/scares but the biggest bit is Mazar’s deleted scenes as she was a bookend of sorts both opening and closing the film. Not to be slept on are the Never-Before-Seen Storyboards, Concept Art And Behind-The-Scenes Photos Courtesy Of Visual Effects Producer Paul Taglianetti. Taglianetti’s archive can be glimpsed in the Skotak and Malone interviews. This featurette gives you, even more, showcasing the truly beautiful work that was done by the Concept Artists and Makeup FX Artists. Rounding out the special features are Theatrical Trailer, TV Spots, Movie Stills And Poster Gallery. As anyone knows that have read my reviews the Trailer and TV spots are favorites that Scream Factory goes out of their way to be sure to include. These late 90’s trailers are some of the best and not to be missed. Scream Factory has given us both a trick and a treat with House on Haunted Hill. Loaded with Special Features and a shiny new Transfer, this one is a can’t miss. Highly Recommended.